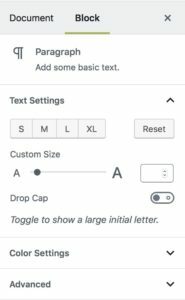 Adding buttons to a Gutenberg block can indeed be done. Dare I say it? Simply. 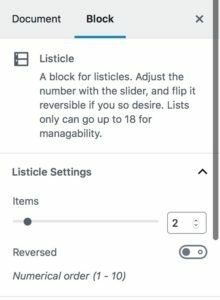 As I’ve mentioned a few times, one of the ways you can adjust settings on a block in Gutenberg is via the sidebar. In fact, this is the default way most people will interact with block settings. But. I don’t actually like it very much. I appreciate that I have it, and I love that I can get it out of the way. But sometimes I like settings to be a little more contextual. One of the reasons we all use sidebar settings is that, well, they’re easy. When I built out my listicles plugin, I could use the inspector controls and automagically I have my own settings. But like I said, I don’t like it very much. It’s clunky, it’s touchy, if you delete the number and type in a new one it’ll wipe all your data. And worst of all, my partner in crime, Tracy, hates it. If your work partners hate a tool, then it’s serious problem. I’ll put up with annoyances to me, but I’ll learn new code for the team. Before I get into the code I used to solve the issue, I want to take a moment to talk about theory and understanding usage. One of the critiques about Gutenberg is that it’s changing too much too quickly, and it’s not listening to users. The problem with that complaint is it lacks context. I’m big on context because I believe that only with understanding the usage and context can we as a whole make the correct decisions going forward. What changes, when, and why depends entirely on what’s being used, for what, and why. It’s much more direct to understand this when I look at my little listicles block. You see, we use it for one thing: to make lists with a specific format. And we have few requirements. An easier, inline, way to add/remove/toggle items. So I sat and I thought about what would be the easiest to use, and I came up with a simple solution. Three buttons, one to add an item, one to remove, and one to toggle the order. Have those show perpetually at the bottom of the list, and you could easily add and remove as needed. This sits inside the <dl> and just below my <InnerBlocks...> insert. It generates the buttons, which change when you hover by default. Now it’s not perfect. If you deleted all the items and pressed delete again, it would sure try to delete. I didn’t put in checks to make sure we didn’t go below 0 or above 18 (which is my current limits). But this is the start to make sure we can keep improving and iterating.